Sergio Ramos re-unites with Florentino Perez? There are news that Sergio Ramos has mended things with club president, Florentino Perez and may stay at the club despite several links and speculation of his departure. 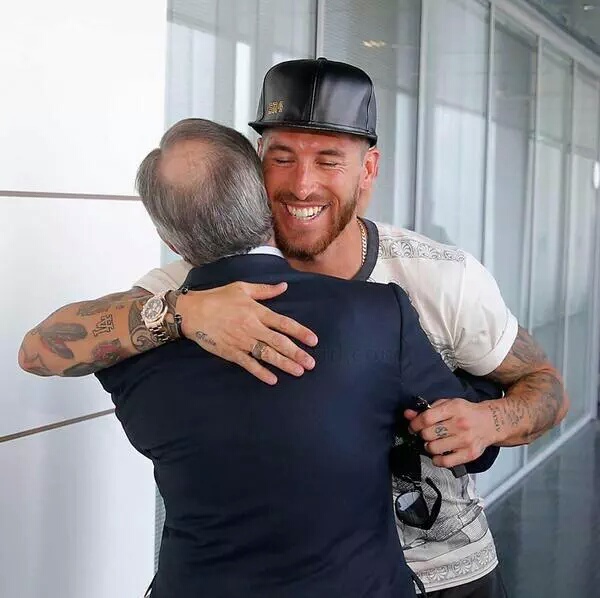 The Spaniard was pictured hugging Perez after a meeting in which they reportedly settled their differences. Sergio Ramos expressed his dissatisfaction in his contract fee and pushed for an increase – a move met with strong criticism from club officials and Spanish media. He has since been linked strongly to Manchester United and host of other clubs. PreviousAsmir Begovic to Chelsea, Given to Stoke, Llorente to Spurs and other transfer gists. “He kicked the chairs, the boots & everything.”Cristiano Ronaldo reveals Alex Ferguson’s hairdryer treatment.